I can't believe it's that time of year again. Our streets are still covered in snow, and the temps this week are freezing! But I am very much looking forward to Easter - it holds such a special place in my heart and I love everything it represents. 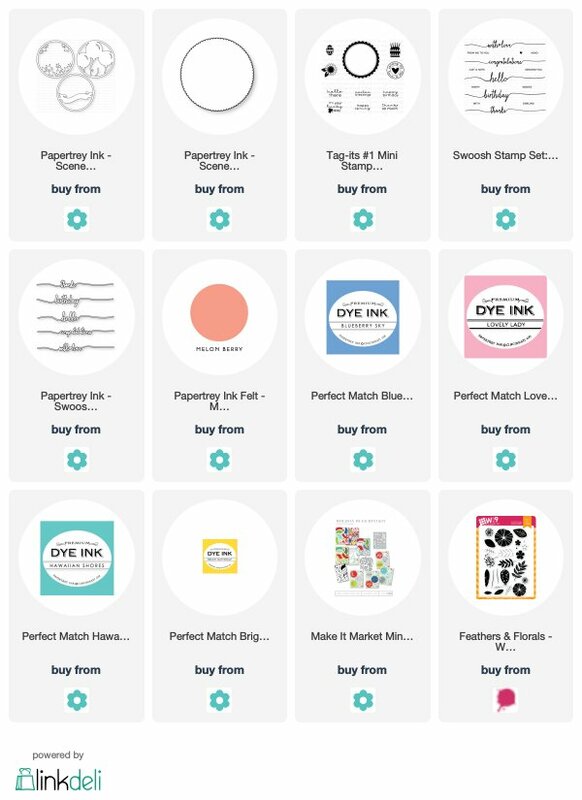 I also love that everywhere you look, Spring colors pop up right about now, and it's the only time of year, when my favorite pastel palette can be found everywhere...From home decor shoppes, to craft stores. It's a feast for the eyes! 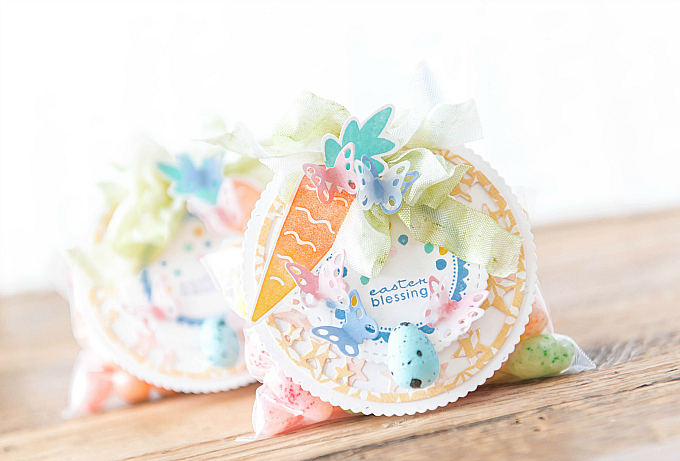 They just happened to make the perfect addition for all the little Easter gift baggies I made. 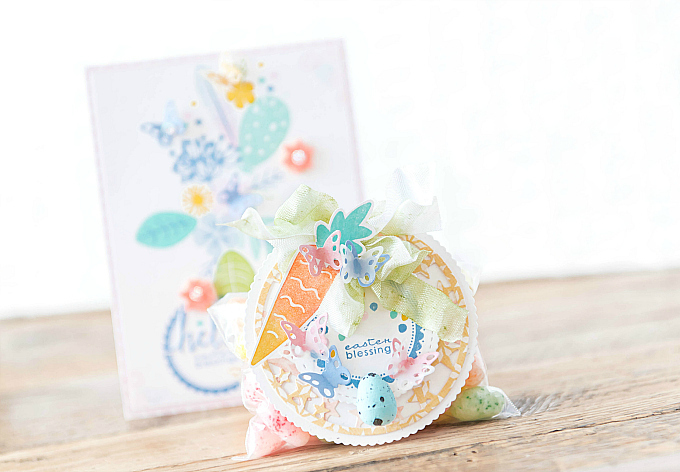 To make the tag for the baggies, I stared with the Scene It: Basic Backer die, followed by two layers of die-cut details, using the Scene It: Celebration die. I cut two different colors of paper using the star design. 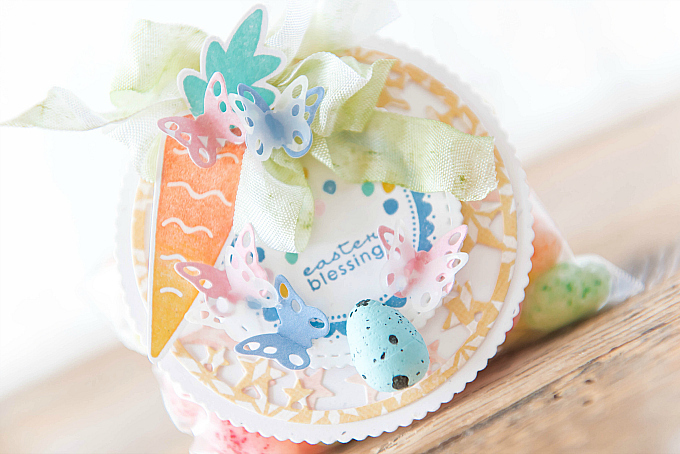 To the side of each tag, I added a stamped carrot. It was just this cute little stamp I picked up at Michael's a couple of years back, and it's one of my favorites to this day! 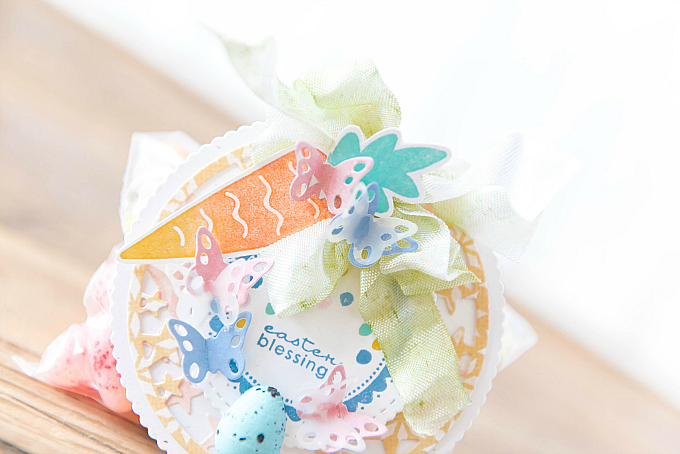 I love the shape of this carrot, and for this particular tag, I added a whimsy, Robin Blue carrot top with Hawaiian Shores ink. For the carrot itself, I loosely dabbed on some Bright Buttercup and Orange Zest ink from PTI. Atop the die-cut layers, I added a smaller scalloped circle tag, cut with dies from the Make it Market: Holiday Hugs kit. 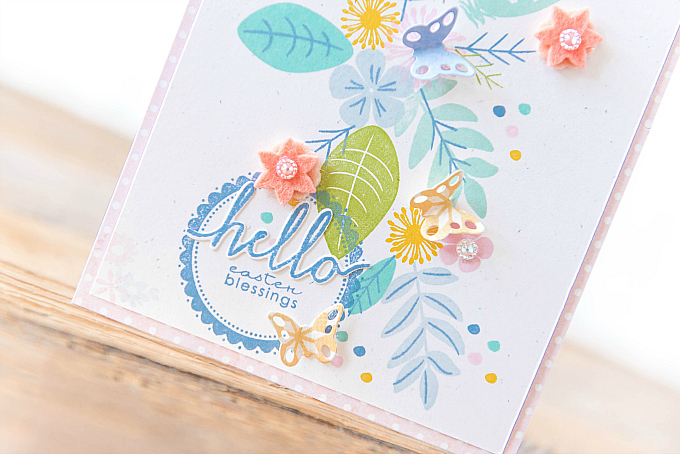 I stamped a sentiment and some fun dots on the tag, using Tag Its #1 stamps and dots from the Feathers & Florals stamps from WPlus9. I used colors of Blueberry Sky, Bright Buttercup, Hawaiian Shores, and Lovely Lady ink. 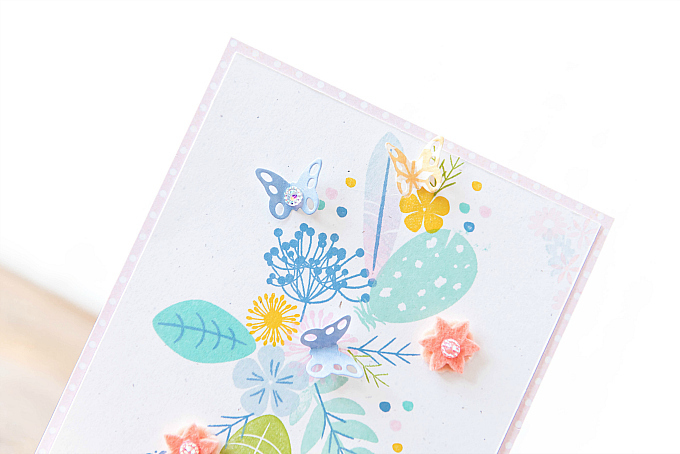 I used a very tiny butterfly die from My Favorite Things (no longer available), and added a variety of butterflies - in pink, blue and delicate vellum. 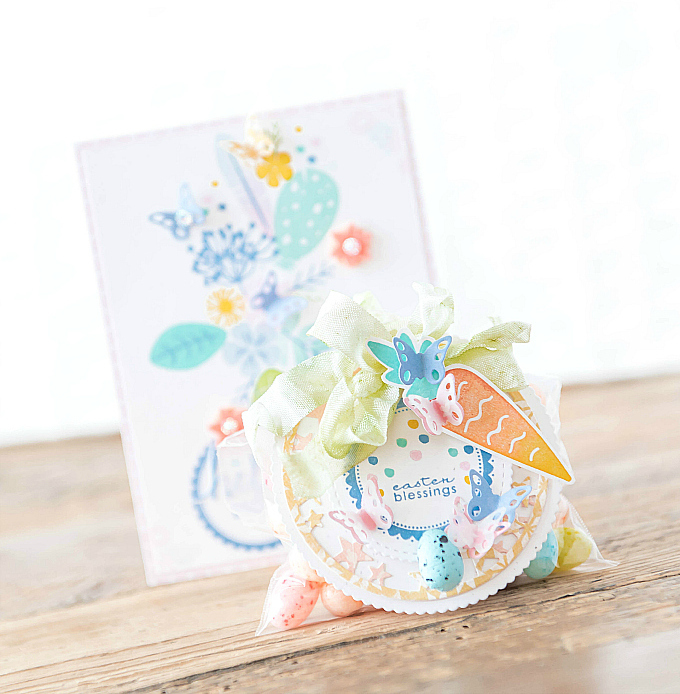 And of course, a wee bit of ribbon, alongside a speckled egg. 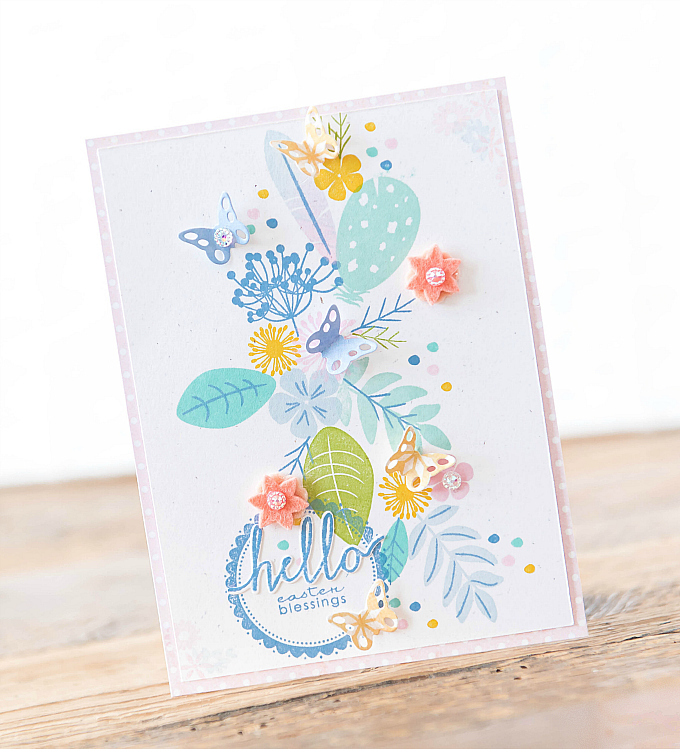 For the matching card, I used WPlus9's Feathers & Florals stamp set, inked up with Hawaiian Shores, Aqua Mist, Blueberry Sky, Bright Buttercup, Lovely Lady, and Green Parakeet. 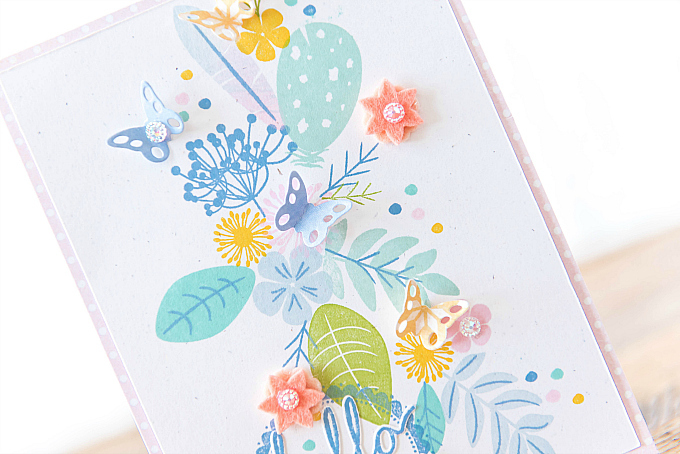 I added some more butterflies, along with a few tiny felt flower die-cuts, from the same MFT die set that has since been discontinued. I used Melon Berry felt, and an apricot felt I picked up at a local craft store. You'll also notice these very pretty, iridescent rhinestones, which I just can't get enough of lately! I picked them up at a local craft store, and I may just have to run out and grab a few more sheets (and maybe share with you all!). For the sentiment, I used Tag Its #1 and the Swoosh stamp and die set from PTI. Thank you for visiting today! May you have a joyful weekend! Oh wow!! These are beautiful!! I love the addition of the little egg on your adorable tags!! The way you stamped the card is perfection. It looks like you printed it. Beautiful design!! Sigh...these are absolutely lovely! The colors are soft and dreamy and I like the wispy designs. Wishing you a blessed Easter!